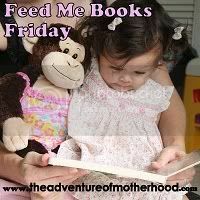 I've decided to participate in today's Feed Me Books Friday meme, held over at The Adventure of Motherhood. Each week she posts a special theme. Today it's all about lift-the-flap books. This sturdy board book has managed to remain intact despite the eager hands of both my children. It is well constructed and has multiple flaps per page, making it perfect even for very young children to explore. A teddy bear is hidden somewhere under one of the flaps on each page spread, so it doubles as a fun search and find. My train-loving son likes to look at the book over and over and over. It's part of a series of Usborne Lift and Look Books, but we've never tried reading any of the others. I picked up our copy at an Usborne book fair. 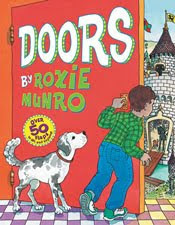 Great for preschoolers and older, my kids love looking to see what is behind each door, searching in an I-Spy kind way. The impressive and highly detailed book includes double lift-the-flaps. (You open the door flaps and there are other flaps to open behind the doors.) The doors lead you into a fire station, train, barn, doctor's office, boat, refrigerator, garage, theater, space ship, and best of all - a door to an imaginary world only found in a book. My daughter wants to live in the castle in this book. Do you have any favorite lift-the-flap books? what fun to find great books. Thanks for the review of Munro book - I will definitely be looking for it. It sounds really like something my daughter would love. 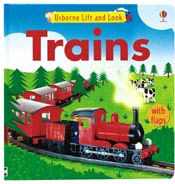 The trains book would be a huge hit at our house! I will have to look into it. Those look like two my son would like too. He is a little more into cars and trucks than trains, but does like trains too. I'll see what state the library's copies are in. These are great! I haven't seen any of them. My daughter actually really likes trains. And I never knew what Usborne had so many great lift the flaps! Every week I get more excited to see more book and find more great blogs like your own. We have a lot in common! Doors sounds like a lot of fun! Ah, Doors looks great! Most of the flap books that I am familiar with are more geared towards toddlers, but my five year old still likes picture books that offer a little something extra! Holt would love trains. We do not have any flap books but they look like fun. My grandson is a huge fan of Thomas and Friends. He would love this book on trains, too. Thanks so much for sharing! My son has an Elmo ABC flap book and a Thomas Flap book that he likes.